More friends and a blog: Families at the beach. 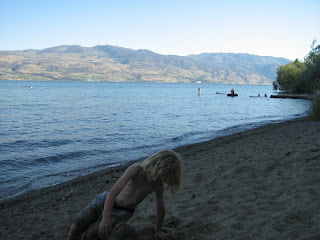 During the summer if we are not out camping then you are likely to find us at the beach. It is not unusual for us to spend the whole day there, from lunchtime 'til bedtime. Yesterday we waited until after an early dinner and then headed down to the beach closest to us for a cool- down. Looks like other families had the same idea. 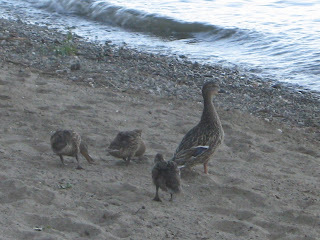 This mama duck kept a pretty close eye on me while I took her family's picture. Dinner included more garlic scapes. 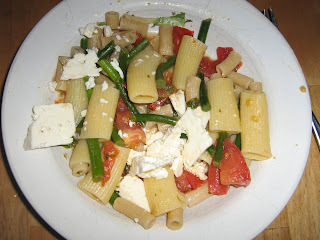 This pasta dish is a pretty common one at our house in the summer and varies according to what is in our garden. It's base is usually garlic sauteed in olive oil then broth, tomatoes and parsley are added. I simmer it for a minute or two and then pour it over cooked pasta. It is good served hot or cold. It can be packed in a cooler and taken to the beach too. I often add basil, zucchini, green beans, sun-dried tomatoes or artichokes to it, last night I used garlic scapes and I think it was my favourite variation yet. You can top it with feta (as pictured here) or freshly grated Romano or Parmesan(as we usually do) or just fresh ground pepper and no cheese is good too. Tempting photos of the lake, Heather. sigh. 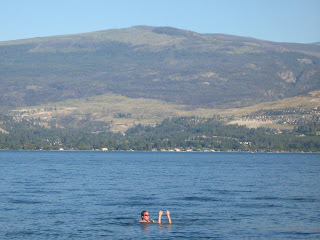 One of the best reasons to live in the Okanagan, isn't it? Hey, I know that salad! It's a summer staple at our house too. I've been doing a Greek version with roasted bell peppers, fresh tomatoes, olives and feta cheese with balsamic vinegar & olive oil... mmmmmmmm... Best part of this pasta salad is its versatility. Can't wait to add green beans to it from my garden.